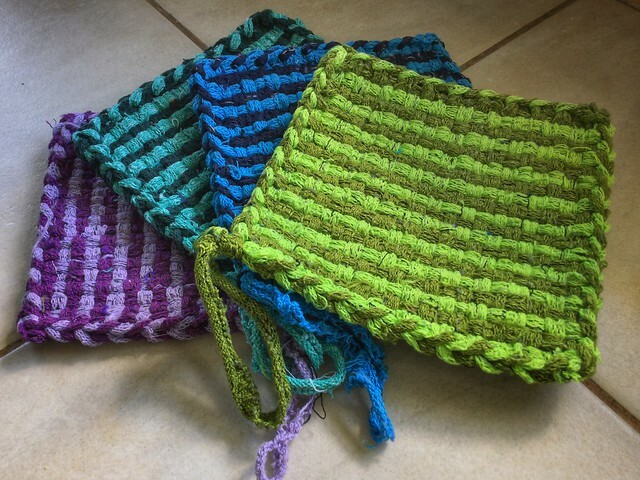 Fun to look at, easy to make, the simplest weaving offers endless variety. 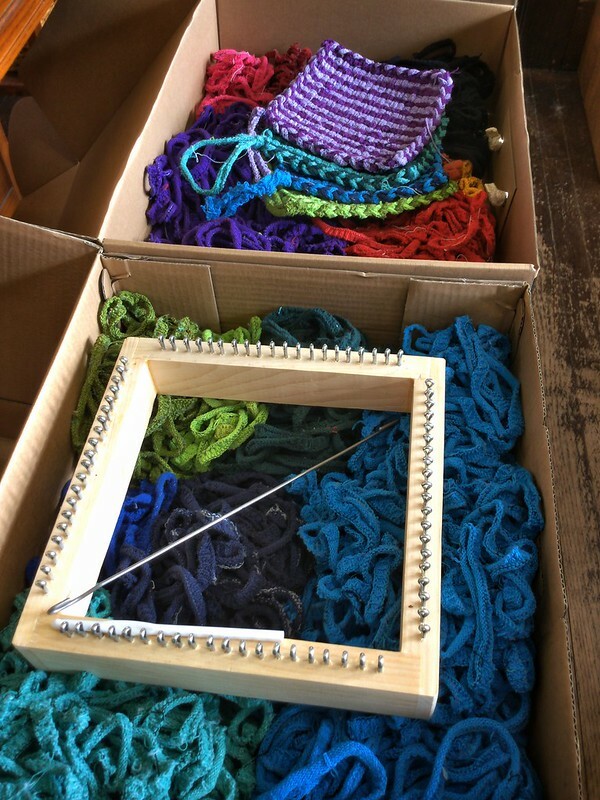 I bought a 10″ potholder loom kit and some additional loopers. The loops are cotton and appear to be remnants from socks. The loom is simple but sturdy. It’s all from Homestead Weaver, and I love it. 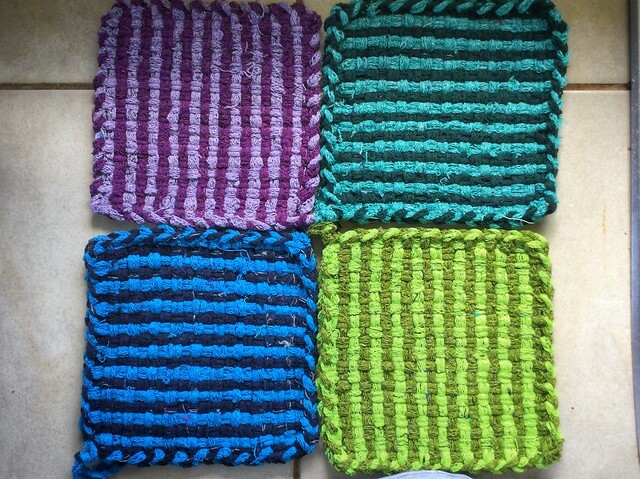 I’ll have a giant stack of potholders when all is said and done, or perhaps I’ll stitch them together and make a rug. 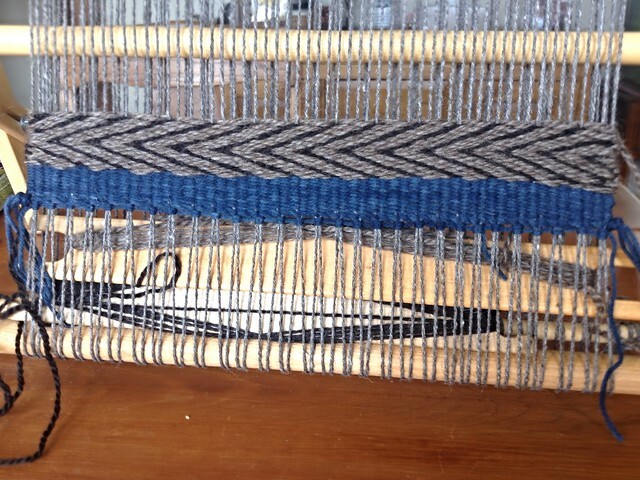 Either way, I’m having so much fun weaving. 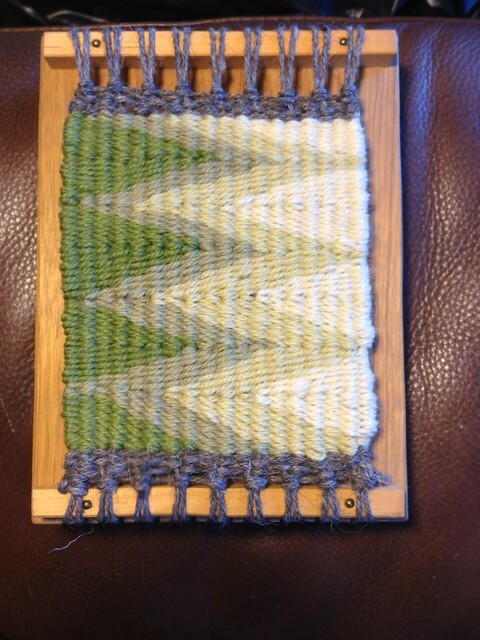 My new favorite book is Norwegian Pick-Up Bandweaving by Heather Torgenrud (2014). 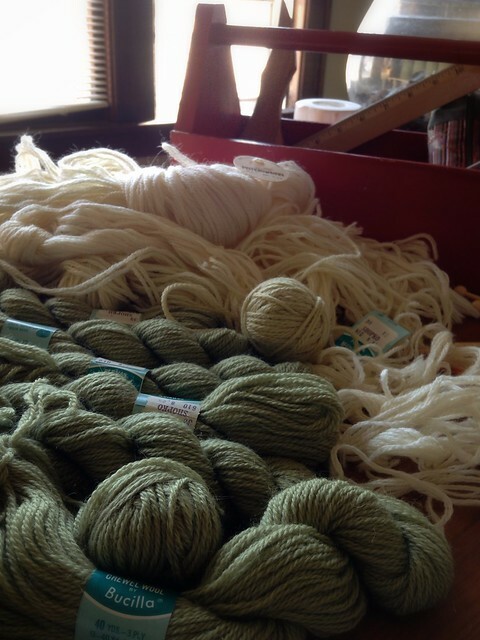 It focuses on everything I like about weaving: the history, the color, the texture, and the process. Plus, there are dozens of patterns. If you have an interest in weaving Nordic-styled pick-up bands, well, here’s your book. 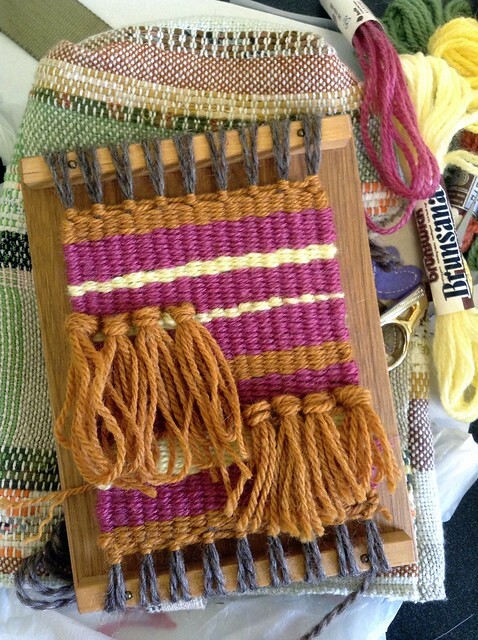 Using a rigid heddle with a backstrap setup, this style of weaving produces sturdy, vivid, and cheerful bands which were once used around the house for things like belts, shoe laces, baby swaddling, package ties, and clothing decorations. 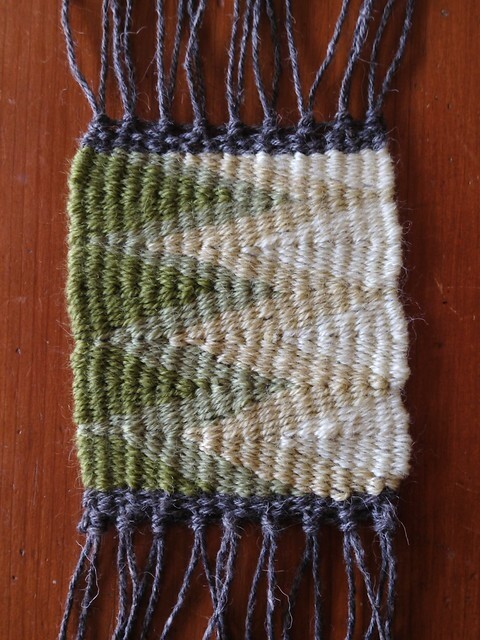 Heather Torgenrud’s book is that type of reading that gets to the heart of an important style of weaving, a delightful discovery for someone like me, the weaver who likes to know. Isn’t it gorgeous? Hand carved, it may have been a traditional courting gift from a young man to a young woman. It was most likely used with the decorative top hanging downward although I’m not positive about that. At the time, I wasn’t certain what it was other than a little loom, and it took some research to come across the explanation. 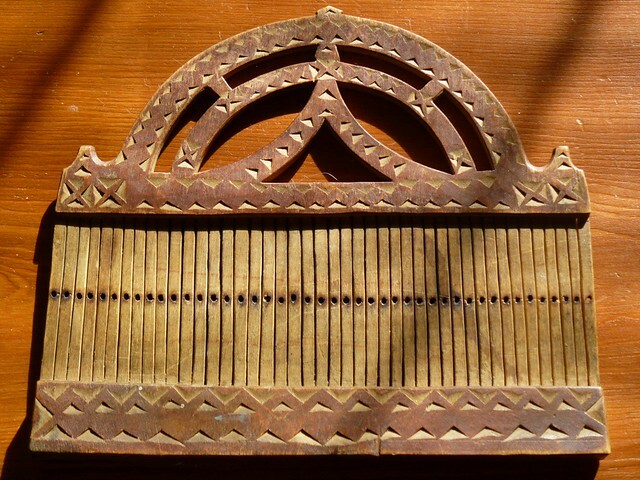 Although you can use a band loom on a regular frame loom, they were normally used with one end of the warp tied to something sturdy like a doorknob and the other end secured around the weaver’s waist, backstrap style. The 1970s are cool again–if you’re a fiber nerd, that is. Maryanne Moodie was the first weaver I spotted who was calling upon the age of shag carpeting to create a more-modern-but-still-earthy wall hanging. 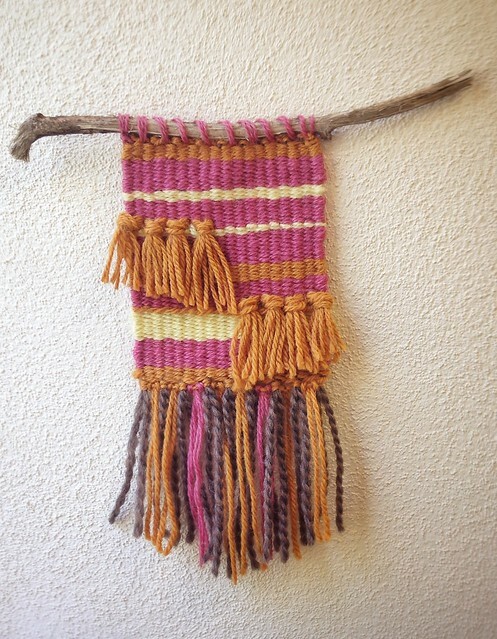 There are several weavers out there doing very creative wall hangings nowadays. If you’re inspired to give it a try, here’s a nice tutorial to get you going. I wove mine on the little Goodwood Pocket Loom, not made any longer, but pretty much any small loom or picture frame will work. 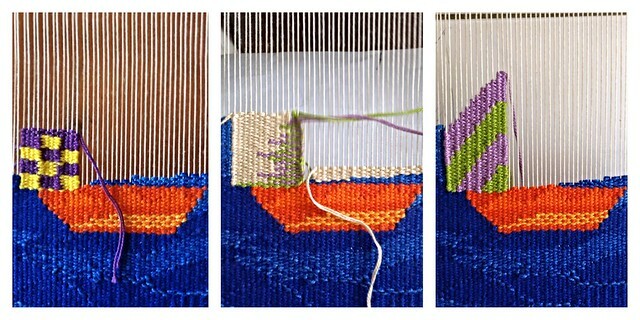 This measures 4″x5″ off the loom, not counting the fringes. This was a fun, fast project that I’d like to do on a larger scale… maybe on my new loom. 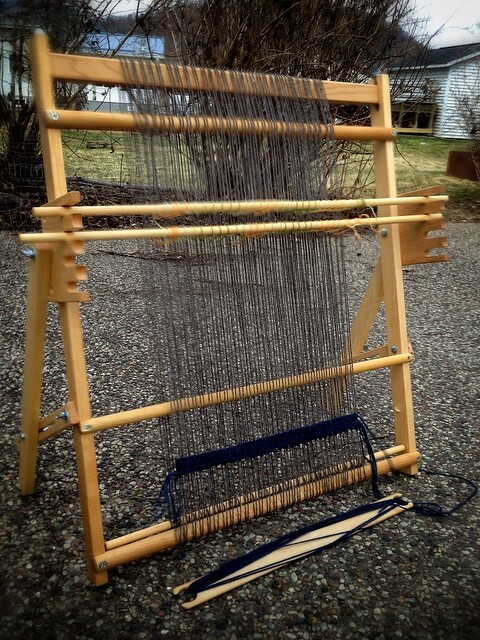 And, no, I’m not talking about the new loom I just posted a few weeks ago but another one, a Hagen tapestry loom that I’ll blog about soon. Done, except for the fringes. I don’t quite know what I’ll do with them. Off the loom, this measures about 12″ square, but it did get narrower the closer I got to the top. Wedge weave is a type of weaving style that gives a distinctive look as the “rows” are woven diagonally. 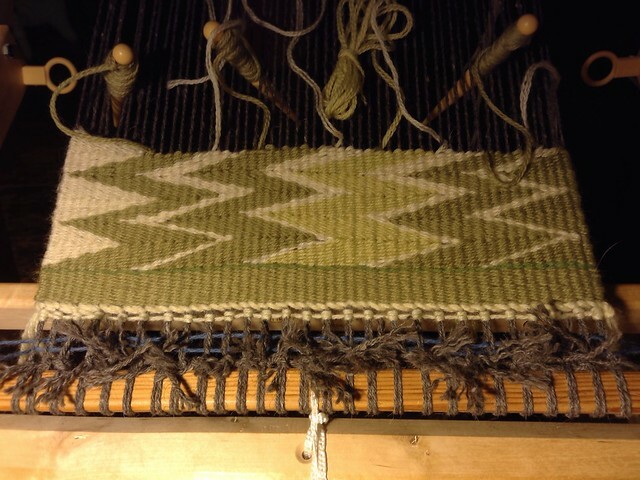 According to what I’ve read, this style of weaving may have become less popular as buyers of rugs wanted a straight edge, and this gives a very unusual scalloped edge due to the way the weft pulls against the warp. 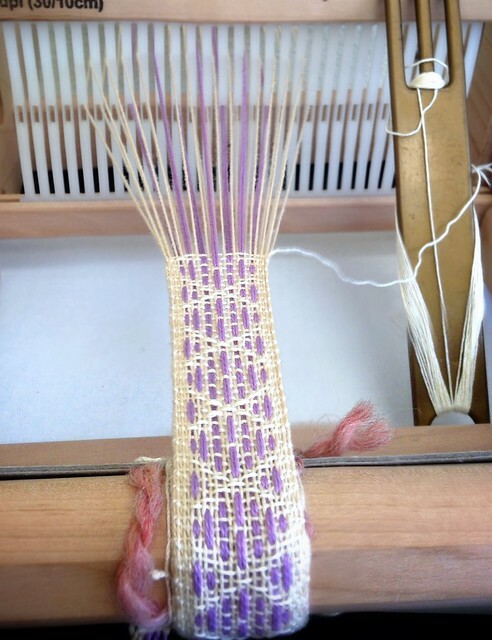 There are many different ways to use this style, and some weavers drop in a little here and there while others weave this way for the entire project. Here are some image searches from Google (hopefully without the wedge shoes that keep showing up! ): wedge weave images. My little sample, about 4″ x 5″, worked out okay for a first try. I learned how to start and stop threads, add new colors, and carry a pattern. I also found out that the loose threads should be woven back in otherwise they’ll pop through to the front. I have some floats here and there, as I puzzled through how to reverse directions. I wove this on a Goodwood Pocket loom. 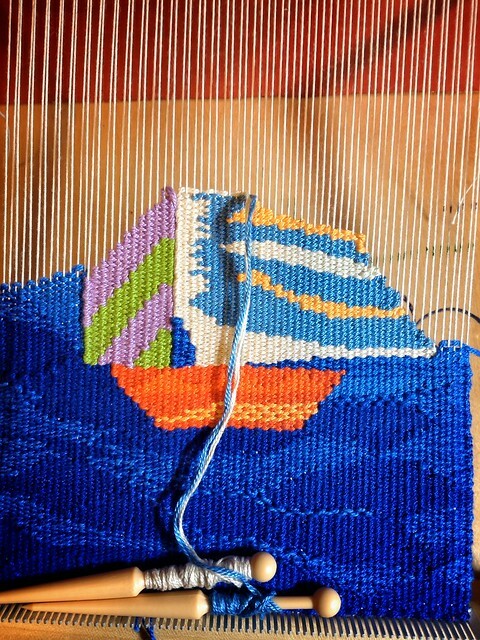 I’m using my Glimakra Emilia rigid heddle loom as a stand-in tapestry loom, and it works great. The loom is a super star when it comes to tension–that thick, sturdy wood and metal pawls and ratchets make it possible. If I learn how to warp it better, I can see using this for tapestry weaving quite often. As it is, I started out perfectly with a warp wound on a warping board, but transferring over became very difficult, so I ended up snipping the ends and tying it on. My plan had been to try for a non-fringe selvedge. Oh, well… that’s how it goes. The string heddles I rigged up proved to be helpful only when weaving that footer. I don’t think anyone trying something similar needs to go to the trouble if using a widely-spaced warp like this one. The day wore on, and at 10 p.m. I found myself still weaving. 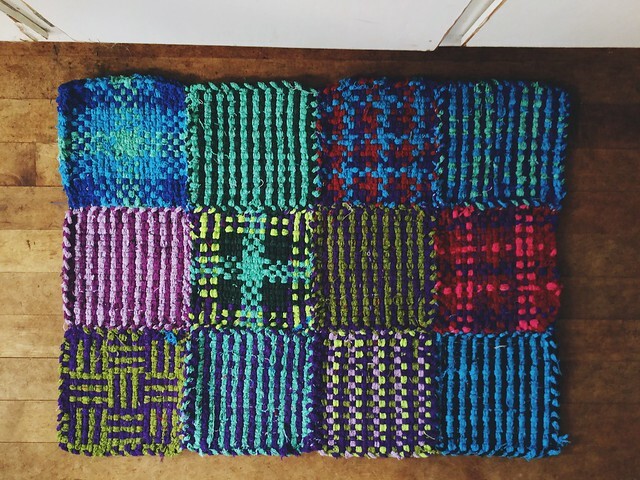 Wedge weave is really fun–and fast as far as a weft-faced weaving goes. Now, I’m at a difficult spot in deciding what to do with the pattern. I’d like to make the center area stand out somehow, and the easiest answer is to use a different set of greens. The hardest answer is to inset some type of tapestry design, but I’m not certain how that will work out. Best idea is to try one, and if it works, stick with it. This is woven on the diagonal. 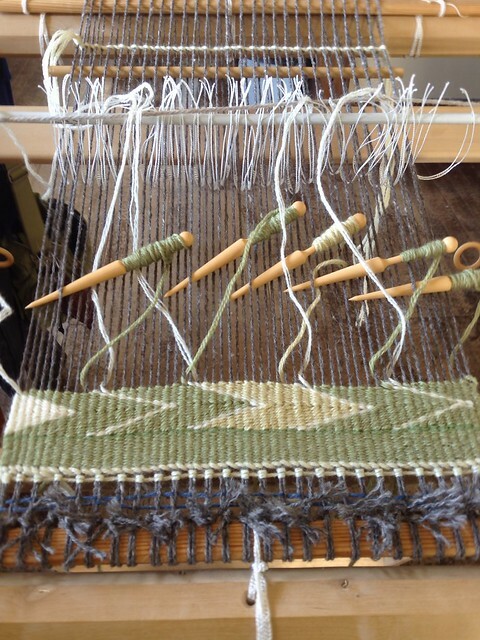 It’s supposed to create a scalloped edge when off the loom, but it may not happen on such a small scale (4″ wide). I’m practicing for a larger project. The cheerful sailboat is starting to come to life. If you think it looks kind of angular, you’d be right. At some point, I’ll post about the design, but because I’m usually willing and able to tear out and do over, design is an ongoing thing for me.